Google's offering is, unfortunately, somewhat disappointing. The biggest problem is its paltry size limitation – 1GB of space is pathetic, especially for a company that has technology dripping out of every orifice. You also have to download software to make use of it, unlike most other offerings, which presents an interesting conundrum. If you don't do much editing, Picasa is a decent tool for the basics – fixing red-eye, lighting, colour issues and so on. However, if you have other tools already, downloading the software is an extra step that you could really do without. Once online, the results are decent enough, with big images, plenty of photo information and the ability to tag and share your photos at will. Still, it's all done with the traditional Google look and feel, which is distinctly cold compared to its rivals. 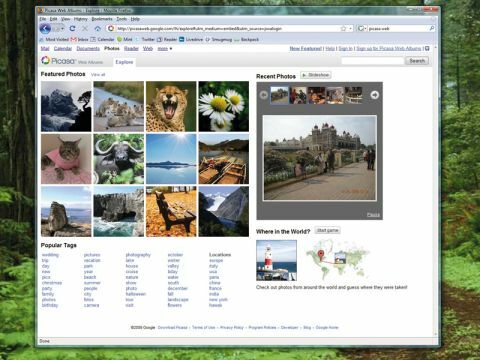 The big advantage that Picasa has over its competition is that the software is solid and the online service is free. However, you're probably better off taking the annual hit to subscribe to one of the more dedicated services.